We are implementing a whole host of measures in our city with the aim of making Ghent climate-neutral by 2050. In almost a decade since Ghent became one of the first cities to sign up to the Covenant of Mayors, the world's largest movement for local climate and energy actions, they have taken significant steps to address their climate impacts. Social inclusion in finding solutions to mitigate climate change plays a key role in the Belgian city's strategy. They have many different activities and tools to help the whole community get involved in both the longer-term planning and the short-term measures in a bid to become climate neutral by 2050. Setup in 2011, ‘Transition arenas’ convene innovators in various fields to support the city, home to nearly a quarter of a million people, in the development of climate policy. Climate working groups have also been established to formulate ideas around specific themes, from farming to the university and the arts. The ideas and solutions coming out these working groups feed directly into local policy. Some platforms are dedicated specifically to school children and young people, encouraging them to come up with ideas and spread the word to their peers. One initiative aims to renovate 3,500 houses each year, including those of the most vulnerable members of society, as part of the 30,000 euro per house scheme. In total this programme will represent a 40% reduction in CO2 emissions from housing. An online thermographic map is used to pinpoint heat loss from houses. Residents can locate their properties to find out about levels of heat loss and are able to consult the city’s environment department for group purchases on roof insulation and advice on subsidies. Vulnerable groups of residents, such as the elderly and the poor, are targeted by an agency offering free services, such as energy scans and guidance, subsidies and low-interest loans for energy efficiency measures. Ghent keeps track of CO2 levels using a 2007 baseline measurement. It has carried out evaluations including monitoring energy flows and exploring the potential use of additional renewable sources, such as wastewater for heating. Ghent mayor Daniel Termont is also the president of Eurocities, a network of over 140 of Europe's largest cities and over 45 partner cities that between them govern 130 million citizens across 39 countries. The group offers members a platform for sharing knowledge and exchanging ideas on issues including climate mitigation. 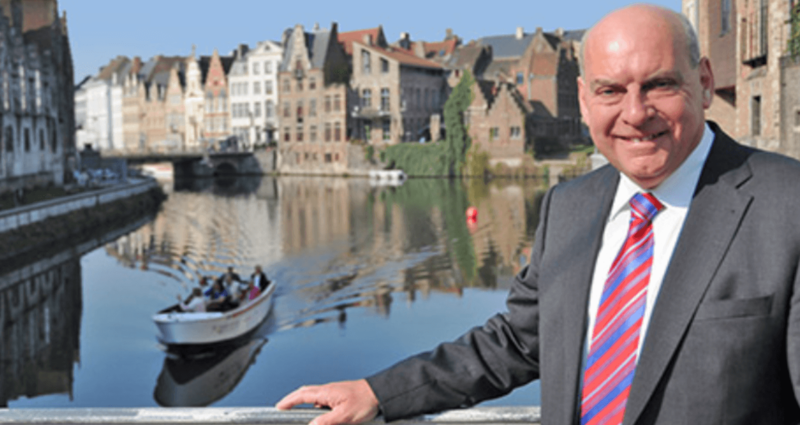 Mr Termont said: “We are implementing a whole host of measures in our city with the aim of making Ghent climate-neutral by 2050. A traffic programme has banned highly polluting vehicles from the centre making a significant impact on air quality. “A policy for tackling food waste is resulting in significant carbon saving and helping the poorest members of society through the redistribution of surplus food from supermarkets. “Important in our energy transition is that the focus on energy efficiency remains very high, combined with local and sustainable renewable energy production through wind, solar and renewable heat. He also believes that cities, such as those within the Eurocities network, have a key role to play in the fight against climate change.